Since January, tensions have flared between the West African country’s authoritarian government and the impoverished masses yearning for democratic reforms. Depending on how developments unfold, the protests in Burkina Faso could serve as a catalyst for further uprisings in the region. On January 18, over 10,000 Burkinabe citizens rallied in the nation’s capital, Ouagadougou (WAH-gah-DOO-goo), and other cities to protest the concentration of political power in one man — President Blaise Compaore, who has ruled Burkina Faso since 1987. While Compaore claims democratic legitimacy, the opposition demands his departure from power, maintaining that Compaore’s past electoral victories were fraudulent and rigged. Compaore’s failure to improve living standards for average Burkinabes also factors into popular resentment of the government. Despite being rich with gold reserves, Burkina Faso remains one of the world’s poorest countries. Nearly half of the 18 million citizens who inhabit this landlocked nation live below the poverty line, and GDP per capita hovers around a paltry $1,400. Fewer than 30 percent of adults are literate and the nation’s infant mortality rates rank ninth globally. Recurring floods and droughts in recent years have exacerbated all of these dismal conditions. The perception that Compaore’s cronies in power have usurped the nation’s resource wealth at the public’s expense has further fueled the opposition’s determination to end his presidency. Compaore’s reckoning reflects tensions that have accumulated gradually since the country’s independence. Burkina Faso’s Cold War experience was marked by violent instability. Following its independence from France in 1960, power changed hands frequently through a series of bloody coup d’états, including a Marxist-inspired revolution in 1983 that installed the Communist leader Thomas Sankara as president. Sometimes likened to “Africa’s Che Guevara,” Sankara implemented radical social reforms, ranging from efforts to abolish gender inequality to the collectivization of agricultural land. He even renamed the republic, replacing its previous name (Upper Volta) with its current name, Burkina Faso, or “Land of Upright Men.” Such reforms drew some support from the poorer sectors of society, but they also created enemies among the economic elite. Under Sankara’s leadership, Burkina Faso faced numerous challenges on the international stage. Burkina Faso and Mali went to war during December 1985 in a conflict referred to as the “Christmas War.” The brief war resulted from a territorial dispute between the two countries over a 100-mile-long portion of desert, rich with minerals, referred to as the Agacher strip. Both militaries engaged in aerial bombings before a truce was reached. More generally, Sankara pitted Burkina Faso against the interests of Western superpowers and their African allies. Sankara was an outspoken opponent of South Africa’s apartheid system and military raids against the African National Congress (ANC) in Botswana, Zambia, and Zimbabwe. Additionally, the Burkinabe leader expressed solidarity with the Palestine Liberation Organization (PLO) and Nicaragua’s Sandinistas. Burkina Faso’s ties with Libya and Ghana prompted the United States and France to fear that the “Burkinabe model” would spread throughout Africa. From 1983 to 1990, Paris canceled foreign assistance to Ouagadougou. On October 15, 1987, Sankara was killed in a coup that the United States, France, and Liberia are widely suspected of helping to orchestrate. Blaise Compaore, who served in the upper echelons of Sankara’s government and was a childhood friend of Sankara himsef, was one of the major leaders behind the coup. Compaore continues to deny that Sankara’s death was intentional. Compaore moved quickly to undo many of the social reforms of Sankara’s government, working to build a neoliberal economy that was integrated into the global marketplace. Burkina Faso returned to its former colonial master France for international support as opposed to countries like Cuba or the Soviet Union. These reforms allowed the country to export its ample natural resources and created a stable political climate for investment. But they also allowed for the enrichment of a small elite, which stoked a growing resentment of the privileged governing class. 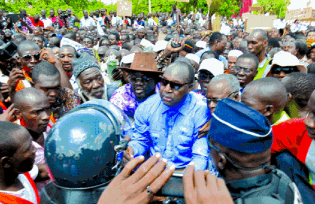 Western capitals have eyed the current protests warily, viewing Burkina Faso as a strategic ally in the post-9/11 era. Certainly, the country’s stability contrasts markedly with the ethnic conflicts, insurgencies, and civil wars that have destabilized the Central African Republic, Liberia, Libya, Mali, Nigeria, and Sierra Leone, among other countries. The government has managed to keep the region’s extremist jihadist forces at bay even as bloody insurgencies are waged in neighboring countries. Burkina Faso has remained a steadfast U.S. ally in the “war on terrorism” and is lauded by the State Department as a cooperative partner in the Trans-Sahara Counterterrorism Partnership (TSCTP), a U.S.-led initiative in North and West Africa designed to confront al-Qaeda. The State Department has not made any major pronouncements about the recent rallies or the possibility of Compaore’s re-election. On the contrary, the United States has remained more concerned with continuing military co-operation through the TSCTP than bringing up the issue of political unrest. Given the potential for Islamist extremists — such as al-Qaeda in the Islamic Maghreb (AQIM), Boko Haram, and the Movement for Oneness and Jihad in West Africa (MUJAO) — to exploit any power vacuum that could emerge in a post-Compaore era, it is doubtful that the United States or France will side with the Burkinabe protestors demanding that Compaore relinquish power. Compaore has also taken credit for mediating conflict resolutions in war-torn neighboring countries. In June 2013, Compaore’s government hosted talks between the Malian government and two Tuareg rebels groups — the Movement for the National Liberation of Azawad (MNLA) and the High Council for the Unity of Azawad (HCUA) — in Ouagadougou. The Ouagadougou Accords that resulted were a preliminary agreement aimed at resolving the lingering tensions between the Malian government and Tuareg rebels following last year’s French-led military operation (Operation Serval) that dispersed AQIM and MUJAO from northern Mali. In 2011, Compaore hosted AU-sponsored talks in Burkina Faso to help mediate the Cote D’Ivoire crisis. Two years earlier, the Burkinabe president secured the release of two Canadian envoys for the United Nations whom AQIM had kidnapped in Niger for 130 days. During the 2008 coup in Guinea, Compaore helped mediate the aftermath. And in 2006, Compaore played a role in brokering negotiations that ended a crisis in neighboring Togo. Compaore’s opponents, however, are unimpressed. They contend that the president’s efforts to mediate regional conflicts and focus on international terrorism are guided by an interest in deflecting criticism over corruption and cronyism within his own government. Burkina Faso’s relationship with Western superpowers cannot easily sustain Compaore’s presidency into its 27th year. Even if Compaore maintains his hold on power this year, he will face new pressures that were not in play earlier in his rule, such as an energized and better connected opposition. At the beginning of the year, 75 politicians from Compaore’s Democracy and Progress Party published a letter that announced their resignation, citing that democracy had “disappeared” from the ruling party. The president’s former allies formed a new party, the Movement of People for Progress, which claims to represent the will of the demonstrators who took to the streets and used non-violent measures to demand an end to Compaore’s presidency. Sam Badger is an associate lecturer of philosophy and graduate student at San Francisco State University. Foreign Policy In Focus contributor Giorgio Cafiero is a Washington, D.C.-based foreign affairs analyst and a regular contributor to the Huffington Post.